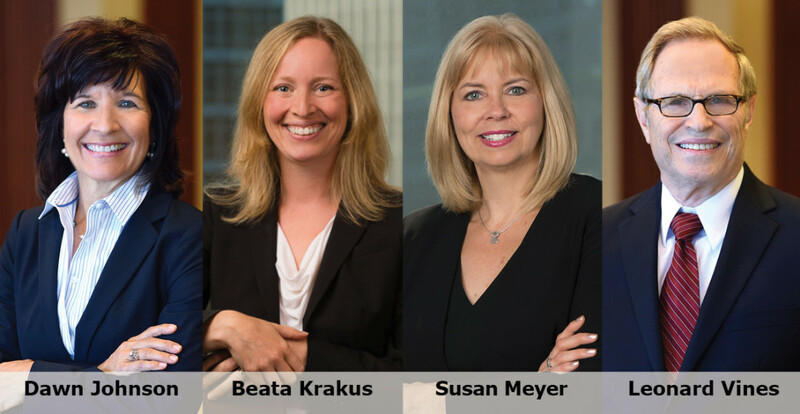 Dawn M. Johnson, Beata Krakus, Susan Meyer and Leonard D. Vines have been named to the Who’s Who Legal: Franchise 2018, which identifies the world’s leading franchising attorneys. Published by London-based Law Business Research Limited and now in its 16th edition, the Who’s Who Legal: Franchise 2018 seeks to identify the top lawyers in franchise law with experience assisting clients in the establishment, maintenance and growth of their franchise businesses. Only lawyers who receive the highest number of recommendations from peers and clients as determined through independent research are listed in the publication. The Who’s Who Legal guides serve as reference sources for companies seeking to corroborate the reputations of lawyers recommended by another party. The guide also lists Krakus on its list of "Other Leading Individuals" in its analysis, describing her as “a 'fantastic' practitioner who is recommended for her experience working with clients in operations around the world." Johnson and Vines are based in the firm’s St. Louis office, and Krakus and Meyer are based in Chicago. All are members of the firm’s Franchising & Distribution group.